Researchers have described a new species of plant-eating dinosaur, Hualianceratops wucaiwanensis, that stood on its hind feet and was about the size of a spaniel. Credit:Portia Sloan Rollings. The Ceratopsia family is growing again. Researchers have described a new species of plant-eating dinosaur, Hualianceratops wucaiwanensis, that stood on its hind feet and was about the size of a spaniel. It is similar in age to the oldest-known member of the “horned dinosaurs,” Yinlong downsi, although both are hornless. Hualianceratops was robust and heavily built, like a chunky version of Yinlong, which was discovered by the same group in 2002. Led by James Clark, Ronald Weintraub Associate Professor of Biology at the George Washington University and Xu Xing, professor at the Chinese Academy of Sciences, the group discovered the two species in the same fossil beds in Xinjiang Province, China. Working from a partial skull and foot, scientists have reconstructed the new dinosaur and compared it to other ceratopsians. 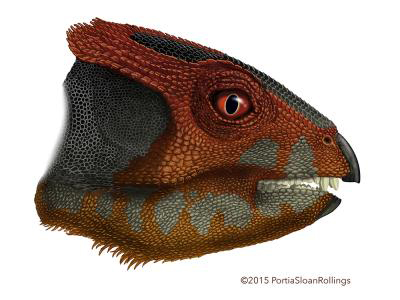 Identifying the new species helps researchers reexamine the pace and pattern of ceratopsian evolution. Hualianceratops lived approximately 160 million years ago (early in the Late Jurassic Period), and the evolutionary relationships the researchers discovered for the new species and other ceratopsians indicate that several lineages of ceratopsians were present at the same time, including the diverse group Neoceratopsia that dominated the Late Cretaceous.